And what better way to spend a summertime evening than grilling these Amazing Vegetables Kabobs in your very own backyard! Just plain, simple food – REAL FOOD – grilled to perfection with a simple but tasty marinade. What can be better? 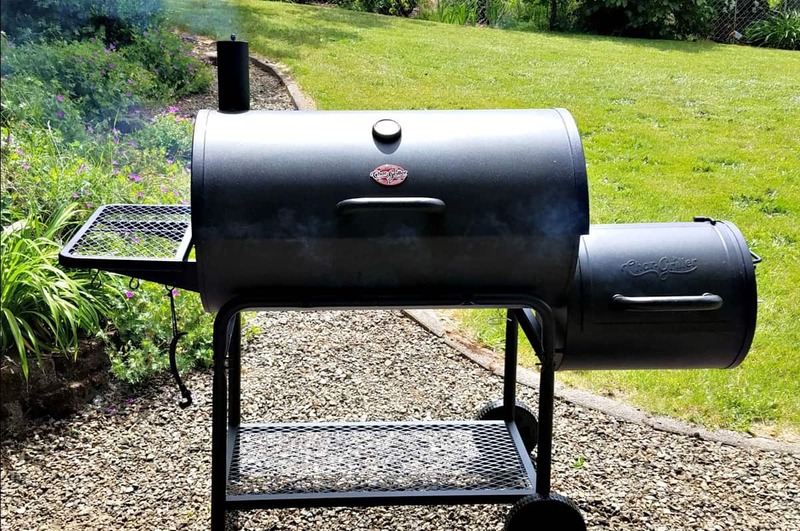 So I asked myself – do I really NEED a new grill? I mean I’m VEGAN! I hardly cook outside anymore. So I asked the question on my Facebook Page …. and the response was overwhelming! YES! PLEASE! Please, post more Summer Picnic Recipes, and BBQ Recipes that us Vegans can enjoy too! So as we head into the warmer months of Summer – expect more BBQ and Picnic type recipes. And I’ll start with a very simple (but oh SO tasty) recipe that I whipped up for dinner last night. All you need is a few vegetables, mushrooms, and pineapple, and a very simple marinade made mostly from Balsamic Vinegar and Dijon Mustard. Are you ready to get this party started? Let’s start with the Marinade. In a small bowl whisk together some Balsamic Vinegar, Dijon Mustard (I love Jack Daniel’s Horseradish Mustard), Lemon Juice, Maple Syrup, Onion Powder, Basil, and Garlic. Bring that to a slow simmer and cook until it’s reduced just a bit. Meanwhile, let’s chop some veggies and yes, I used Potatoes. (Note: Use the little Baby Potatoes if you can. Otherwise, you’ll want to pre-cook the potatoes just a little so they’ll finish cooking on the grill). I also used Mushroom Caps, Cherry Tomatoes, Green & Red Bell Peppers, Onion, and Pineapple. Zucchini and Eggplant would work too. Just try to chop everything to roughly the same size so they cook evenly. Toss all these in a bowl and add the marinade. Cover and give it a little shake to make sure everything is coated and set aside. Also, if you’re going to be using wooden skewers for your kabobs, now would be a good time to soak them in cold water. Ok guys, this is the point where you grab that cool adult beverage (if that’s your thing) and go fire up that grill! Charcoal or gas – whatever you have – now is when you get it ready as you’re marinating your veggies. Be sure and give that bowl of veggies a shake occasionally to make sure everything is covered in the marinade. Don’t have a grill? No worries. I cooked mine on a grill, but you could use a grill pan on the stove, a George Foreman electric grill, or just roast these in a hot oven. Whatever you got. Once the grill (or whatever cooking vehicle you’re using) is ready, let’s assemble our skewers. 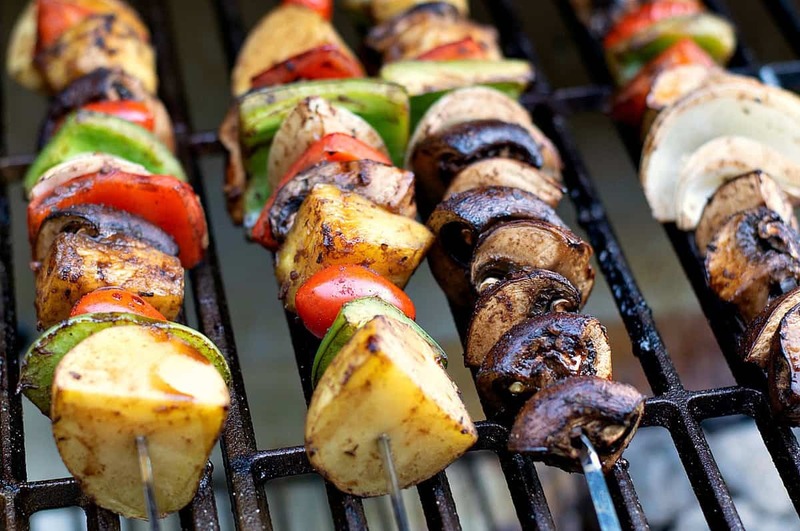 Skewer your marinated vegetables on either metal or wooden skewers and place them on the grill. Save any leftover marinade for a basting sauce as you cook your kabobs. 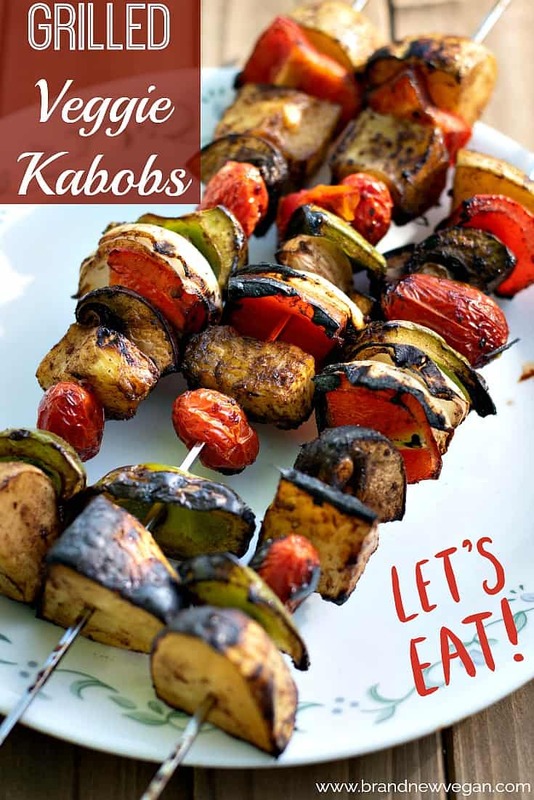 It will only take about 8-10 minutes total to cook your Kabobs. so watch them carefully and baste often. That’s it! I also roasted an ear of corn for the wife and I and it was fabulous. SO sweet and juicy. If you haven’t tried my Corn Butter on freshly roasted ears of corn, you’re really missing out. Hope you enjoy my new Summertime Series. Be sure and leave those comments and we’ll see you next week for another yummy recipe. "It's summertime summertime sum sum summertime...." These grilled Vegetable Kabobs will soon be a Summertime favorite! Freshly grilled veggies basted in a tangy Balsamic Marinade. Who doesn't love grilled veggies over a fire? Yum! Chop all vegetables (and fruit) into equal sized pieces and set aside in a small bowl. Whisk all marinade ingredients together over low heat and simmer for 2-3 minutes or until slightly reduced. Pour marinade over vegetables and cover. Lightly shake to evenly coat all the veggies with the marinade. Prepare grill if using and preheat. 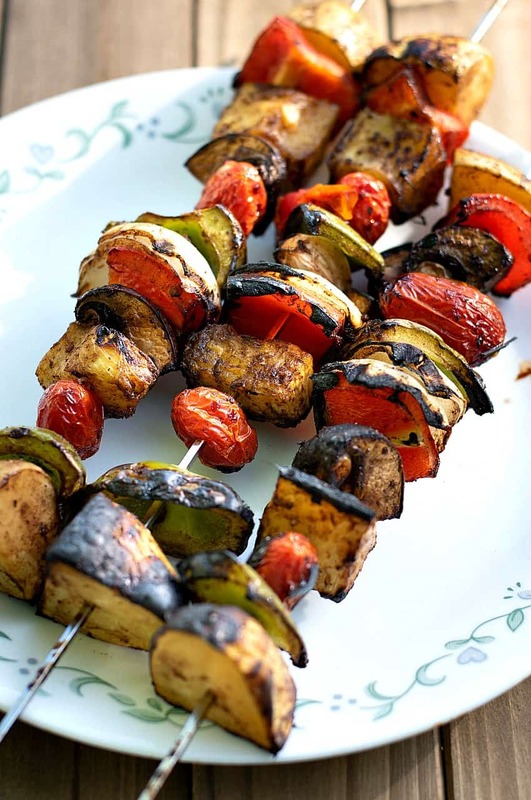 Assemble veggies onto skewers and grill for 8-10 minutes or until potatoes are cooked through. Baste with remaining marinade. Made the veggie kabobs tonight & they were delicious! I loved the marinade. Thank you, Chuck, for all your delicious recipes! Hi Chuck! It doesn’t say how long to marinade the veggies. Just long enough to get the grill hot? Thanks!! If you still want the tofu “on the side” without heating the kitchen etc, cook them in waffle iron! They come out chewy/crunchy good.